I am contemplating using one of three historical patterns from The New Carolingian Modelbook – all done in monochrome: If you have a copy, here are the citations. Plate 33:1 – an extremely long block unit repeat, which I would embroider in voided style (working the background, not the foreground) in either cross stitch or long-armed cross stitch. This one is of a complicated interlace sporting grape leaves, and columbine flowers.The strip is 53 units wide, and the entire pattern repeats in about 308 units, center to center. The first publication I found of this was in a modelbook printed in Lyons dated 1533, although it was reprinted at least once by a different publisher in Venice in 1546. Plate 63:1 – one of the more open straight stitch unit motifs, not suited for knitting or cross stitch but perfect for double running stitch (aka Spanish stitch, Holbein stitch) work. This one is an interlace with pomegranate and acanthus motifs. It’s also 53 units wide, but the repeat is complete in 146 units. This one was graphed from a photo of a boy’s shirt, circa 1540. 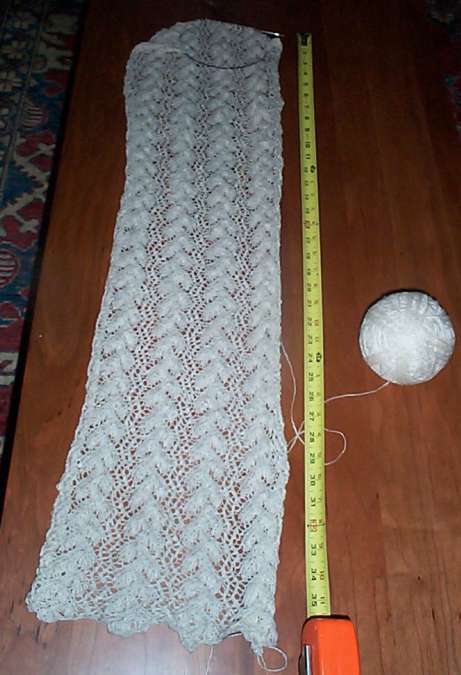 Plate 69:1 – another straight stitch motif. This one is of grapes and grape leaves, 65 units wide, with a repeat complete in 127 units. If you happen to have a copy of Drysdale’s Art of Blackwork Embroidery, the original 16/th/17th century Spanish artifact this was graphed from is also shown there on page 33. I have not sewn curtains before, but it should be pretty logical. Especially for something this plain. I’ve you’ve done this and have warnings or spot flaws in my thought processes, please chime in. I want flat panels with little or no extra width compared to the window. I want to sew little brass rings on the top that will be threaded onto a narrow brass rod, so I don’t have to allow for a header. I am also going to line the curtains to improve drape, give a bit more privacy, make the back neater, and increase their thermal retention (such as it will be). My window is 44 inches across, from one edge of the sill to the other. 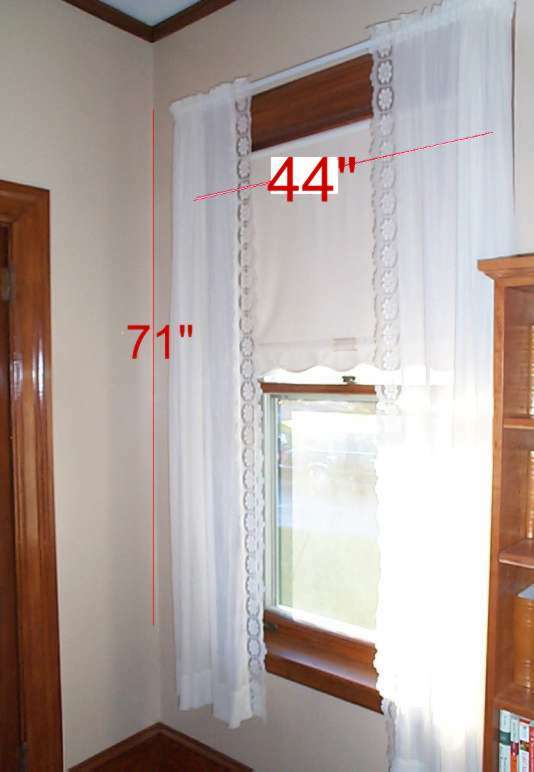 My window is 71 inches from top of the casement to the surface of the sill, and 74 inches from top of the casement to the bottom of the casement. It looks like any of the fabrics listed above would be wide enough to provide the two panels I need for the window side by side. Since I would be hanging the things from a rod attached to the casement, about .75 of an inch below the top, and the rings are likely to be about an inch in diameter, I’d subtract about 2 inches from the 71 for total finished length. That gives me two mirror image panels about 23 inches wide x 69 inches long. I have enough width in my fabric for seam allowances. My guess is that for stability and drape, I’d want a hem of about 2 inches at the top, and about 4 inches at the bottom. That means that for each window I’ll need to buy about 2.25 yards of linen, plus an equivalent amount of lining fabric. Now which fabric would be suitable for which of my motifs, and how would I go about placing them on the curtains, and how would I treat the right-angled corner when using designs that don’t provide that detail? Obviously more public contemplation of this project will appear here. Just had a thought. Have you got any cheap fabric you could run up a panel in the size you want and try it up at the window (in effect a curtain toile!) or buy a cheap pair from a ?thrift? shop to experiment with pinning and shaping to see what the size will look like?